Technopath’s Multichem S Plus Control is intended for use as third party, tri- level, liquid stable, multi-analyte quality control materials to monitor the precision of laboratory testing procedures for Chemistry and Immunology assays. Multichem S Plus contains 103 analytes, including the addition of C-Reactive Protein and Rheumatoid Factor at clinically relevant concentrations. NOTE: This is the main difference between Multichem S Plus and our other ‘regular’ Multichem S product, i.e that CRP and RF are added to the Multichem S Plus product only. Multichem S Plus Control is designed as a liquid stable frozen product. The product will typically be run after reagent calibration and at a frequency dictated by laboratory QC procedures and reagent / instrument manufacturer instructions. 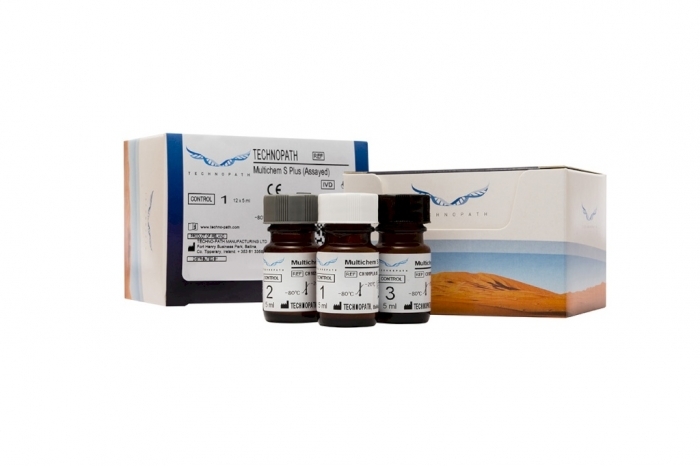 The product should be treated the same as patient specimens and run in accordance with the instructions accompanying the instrument, kit or reagent being used. The control should be stored at -20°C to –80°C and thawed as per IFU prior to use. The product should be stored at 2 to 8°C between use.